The Alabama Theatre was completely renovated in the late-1990’s. The theatre is currently owned by Birmingham Landmarks and is used for music-related events throughout the year. Performances include ballet shows, music concerts, and film releases. Directly across the street from the Alabama Theatre is the Lyric Theatre. This theatre was built in 1914. It was originally built as a vaudeville theatre. Vaudeville is a type of entertainment that focuses on comedy and laughter through the use of song and dance. Similar to the Alabama Theatre, the Lyric Theatre is currently owned by Birmingham Landmarks. The Lyric Theatre auditorium is unique due to the fact that the seats are built close to the large stage; thus, providing the audience with a close-up connection to the performers. This theatre is also used today for events such as ballet performances, music concerts, plays, and the symphony. It was recently renovated and is more beautiful than ever! The Carver Theatre was built in 1935. This theatre is a bit smaller than the other two theaters that were previously mentioned, but it is very significant in the history of Birmingham. This theatre provided African-Americans with the first place available in Birmingham for them to see first-run film releases. Prior to the building of the Carver Theatre, no such place existed. The Carver Theatre was renovated in the early 1990’s, after it was purchased by the City of Birmingham. It currently is the home to the Alabama Jazz Hall of Fame. The theatre hosts many musical events annually. As one can see, Birmingham is a town that is full of rich history and culture. There are many historic buildings and theaters that can be explored by the curious history-seeker. 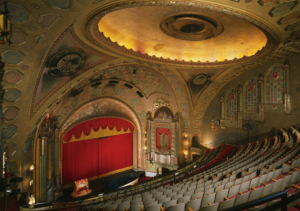 The renovation of these beautiful theaters provides audiences with places to find entertainment in many genres; including music events, dance performances, plays, and musicals. If you are lucky enough to enjoy a performance at one of these theaters, savor the history that these Birmingham landmarks provide.